When it’s a prepared piano. A prepared piano is typically a grand piano that has been either modified in some way or is being played using atypical methods. One might prepare the piano by putting mutes, coins or bolts s into the strings. One might lay chains or paper on top of the strings, or reach inside to smack the frame with a mallet. Mallets might be used to strike the strings, or one might use one’s finer to select the harmonics of a particular string. Sometime a metal bar is rolled along the strings to create sweeping glissandos. Even bows have been used on piano strings. Amplification produces another sonic layer in the prepared piano world. Putting a variety of such unusual techniques into practice on a single piano adds up to a prepared piano. And while one might go to great lengths to note the locations and types of preparations, no two are ever completely the same. I’ve worked with a lot of sampled prepared piano libraries between the late 1980s and now, but none has completely satisfied me. The original John Cage library issued by McGill University was a good first start. The range of sounds was excellent, and the sound quite good for its day. But you had to build your own keyboards, and there was no deep sampling of how things sounds at various gradations of touch. A few more came along in the 16 bit era but none better than the Cage library. The 24 bit era has seen several approaches, most recently the UVI IRCAM Prepared Piano Library. It had a wealth of intriguing sounds and a broad range of sampled sound production techniques. It also let one create custom layered sounds, But while it had some depth, it still lacked round robin triggering which could have made it substantially more versatile and believable. Soniccouture has produced bowed and mallet pianos, and Vienna Symphonic Libraries has produced an excellent prepared piano library, albeit without round robins and requiring numerous instances to get a fuller range of sounds. 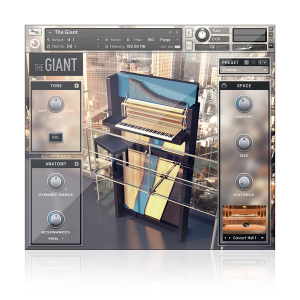 And just recently a library of palm muted piano sounds came out for Kontakt from Sampleism. Imagine my surprise at getting Native Instruments’ The Giant Kontakt sample library as part of its Komplete Ultimate package. I assumed it was an upright piano library until I started screwing around with it and discovered it had much more under the hood than mere upright piano sampled. There were strums and smacks of the soundboard, winding sounds, harmonics and much more. Long durations sounds and quick tones. Chimes and muted sounds. And it appeared that there was also a bit of round robin triggering to make sequential triggering of the same key result in something very realistic sounding. The sample package is available as a stand-alone library for $99. It requires full Kontakt 5. But it includes far more than just prepared piano sounds. It may well be the most versatile upright piano sample library on the market. ~ by Daniel Buckley on May 20, 2013.